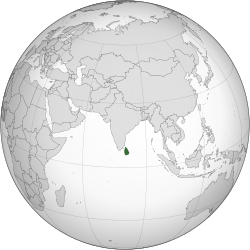 ↑ ୫.୦ ୫.୧ ୫.୨ ୫.୩ "Report for Selected Countries and Subjects: Sri Lanka". International Monetary Fund. April 2011. Retrieved 21 August 2011. ↑ "'Ceylon' to change 'Sri Lanka' | Breaking News". dailymirror.lk. 2010. Retrieved 10 January 2013. Ceilão was the name given to Sri Lanka by the Portuguese when they arrived in 1505, which was transliterated into English as Ceylon. As a British crown colony, the island was known as Ceylon, and achieved independence under the name Dominion of Ceylon in 1948.